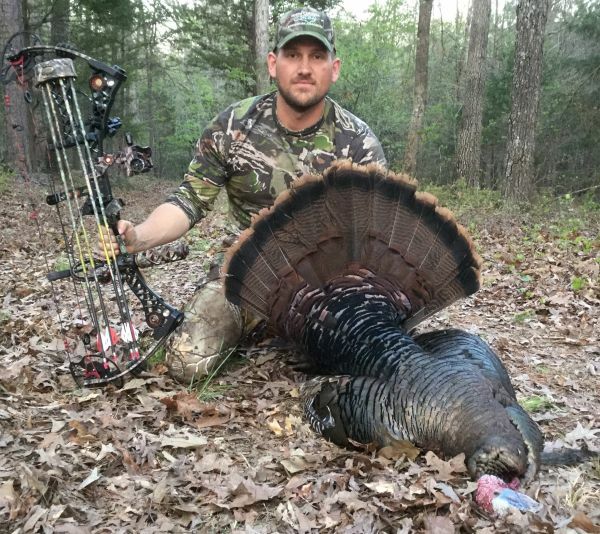 After Jake Muehlbach took a few career bucks on his Chatham County hunting land last fall, he was ready to chase another dream — shooting a big tom turkey with his bow. And on the afternoon of April 18, a longbeard couldn’t resist the appeal of his Avian X hen decoy, making it easy for Muehlbach to check off that box on his bucket list. Muehlbach knew that killing a turkey with a bow has its complications. First, the kill zone on a turkey is about the size of a tennis ball and when they are strutting around and bobbing, the kill zone is a rapidly moving target. If the shot is a little outside of the direct kill zone, the bird will fly off making it nearly impossible for the hunter to retrieve it. And although they have pea-sized brains, turkeys have incredibly keen eyesight, making it nearly impossible to draw back when the turkey is present. But, Muehlbach attacked all hurdles and found reasonable solutions to set the stage for his challenge. He practiced for several weeks before the season opener with his Mathews MR7 from a kneeling or sitting position, and he chose the Avian X Jake decoy, one of the most life-like turkey decoys on the market. Muehlbach was in the blind for the better part of opening weekend. He knew there were several good gobblers in a small meadow beneath several large oak trees along an old fence. So for two days, he worked several birds there but just couldn’t lure them into range. A few days later, he got off work with just enough time for an afternoon sit. “I had a feeling that the birds would be active and I got in the blind a little after 5 p.m. with my decoy set up 20 yards away,” he said. Muehlbach prepped his bow to be ready for a quick shot and pulled out his slate call and box call. And before he could start his first calling sequence, he spotted a couple of hens grazing toward him. He waited around for a little while and then started with a few light yelps with the slate call. “The closest hen didn’t seem alarmed by my calls. So, I transitioned to my Turkey Thugs box call which was significantly louder,” he said. He hoped to hear a gobble in the distance. Instead, he looked up and saw a longbeard silently working his way toward the decoy within minutes of his calling. The turkey didn’t waste any time coming to the decoy and neither did Muehlbach. “I steadied my sight pin on his body and released my Carbon Express arrow and watched it penetrate his body. After only a couple of flops of his wings he fell motionless in his tracks. I was surprised how quickly my Rage Hypodermic broadhead put him down,” he said. Muehlbach’s bird weighed 20 pounds with a 9-inch beard and 1-1/8-inch spurs. Andy Speer Taxidermy from Troy, North Carolina will be mounting his trophy.